Soooo, you’ve been waiting for this moment since you fell in love. He finally got down on one knee and put a ring on it! This is where the fun starts, and you begin to organise the day you’ve been dreaming of. You choose the perfect venue to entertain your guests, pick your photographer who shares your vision and purchase the most beautiful, not to mention expensive dress you’ll ever wear ion your life. This is also the time you choose your hair and makeup artist who is going to create the most beautiful look just for you to captivate your groom, and if all goes well, get a little tear or two! This is the biggest mistake most of my brides make, and more often than not, I send them off after the pre wedding trial to get their hair cut, layers or just the weight taken out of it. Without regular maintenance your hair will look limp, dull and the ends broken. Myth: If you have your hair layered it’ll make your fine hair look even more finer looking and flat. Truth: By asking a talented hairdresser to cut your hair in a way to keep maximum length but fuller volume, your hair will look healthy, volumous and sit more beautifully on your wedding day. If your dream bridal hairstyle is full bodied, soft, and effortless looking…you know the styles you’ve been saving on your Pinterest board… you NEED layers. Hair which is one length will be bottom heavy and flat, therefore you will not be able to achieve that soft look you’re looking for. If you think you might require extensions to give you more length/volume, why not book a 10 minute consultation with your bridal hairstylist and get their advice. You might not need them for your chosen style, or you may rather go for clip in extensions just for the day. If you decide to have semi permanent extensions applied, always check the qualifications of your extensionist, reviews, quality of hair and whether they can blend the extensions into your own hair. Otherwise you will need to visit your own hairdresser after application to get them blended so they don’t sit too heavy. They also shouldn’t be applied closer than 1 inch from your hairline or above the upper 1/3rd of your head. Do your research and ask questions! So the bottom line girls is, when you get that ring, book yourself an appointment with your hairdresser and ask for their advice on keeping your hair in tip top shape for your wedding. Purchase salon quality aftercare products. They DO make a difference. Also, don’t be afraid to ask advice from your bridal hairstylist, as we are only happy to offer our advice and ensure you are being realistic about your chosen style. After all, we are the ones who will be creating your dream hairstyle on the day, therefore we want it to be looking and feeling it’s best! Enjoy your wedding planning, and hopefully see you soon to create your wedding hair! 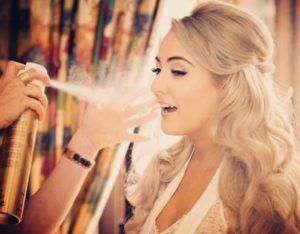 Olivia Muldoon is one of the leading hair and makeup artists in Ireland, specialising in weddings in UK and Ireland and further afield. With over twenty years experience, including being a qualified hair extensionist she travels all over the country training hairstylists in the art of hairstyling and bridal hair.